Roguelike 2D Chopper Flying, PowerUp Fueled Arcade Action Game. Skillfully Command, Upgrade and Deploy Your Squad Forces to Defeat the Incoming Waves of Enemy Forces. Randomly generated levels provide Endless Variety and Challenge with each Playthrough. ● ChopperSquad X – ChopperSquad X is a 2D action roguelike game with permadeath (You only have 1 life). It’s a twist on the traditional Tower Defense game formula. In traditional Tower Defense you place stationary towers and upgrade them as enemies march past the towers to their final goal. In ChopperSquad X your objective is to guide your troops to the Landing Zone (LZ) for pickup. As you travel through enemy territory you can rescue hostages, recover valuable loot and activate soldier buff stations. In ChopperSquad X the troops are the towers and you upgrade them via buff stations inside buildings along the path to the enemy HQ. Buff stations enhance the health, damages, attacks, etc. of your troops. Instead of you stopping the enemy with stationary towers (traditional tower defense) in ChopperSquad X the enemy tries to stop YOU from reaching the final goal. Also you’re required to be active in the game instead of just set-and-forget. Chopper powers have limited effective range (which can be boosted) so to effect your soldiers you have to fly close to them while avoiding enemy fire. ● Simple Goal. Simple Controls – Trek through enemy territory to get your troops to the landing zone (LZ) for pickup. Your troops are underpowered but can by boosted by powerup stations inside buildings that you control and powerups the player can activate whenever needed. Equip your troops with Ammo, Health, Extra Defense and more with the click of a mouse (or controller). Call in Air Strikes, Smoke Bombs, Etc. to enhance their offense and help them survive the dangerous journey. Its all up to you. Good Luck!! ● Platform – PC, OSX and Linux editions will be released following shortly after the Windows release. Xbox and PS4 are future possibilities once development kits for those consoles are obtained. 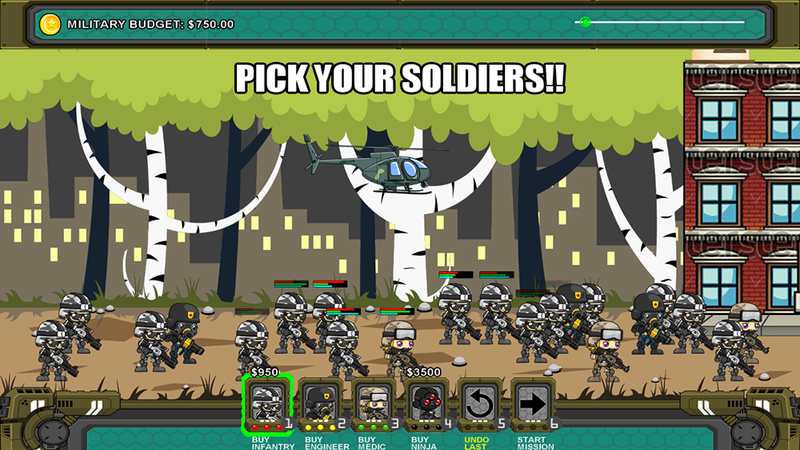 In ChopperSquad X your ‘towers’ are the soldiers you choose. The makeup of your squad is completely up to you. Want more Ninjas then Infantry? Medics than Engineers? Its your choice. There are 4 type of soldiers and each has their own special ability. ● You need each other – Troops start each stage at the lowest level and and must level up to survive as they cross the play field. The enemy waves gets tougher as you travel deeper into enemy territory and the only way your troops can keep up is to takeover building buff stations. Some require rooftop entry which can only be provided by chopper and the ground troops can only be targeted by soldiers and the airborne enemies can only be targeted by the helicopter. You have to help your soldiers level up in a timely manner or the stronger guards will overwhelm them and your mission will fail. ● Infantry – This is your core basic soldier and will probably be your most used. They are cheapest to outfit and equip and can be effective offense against the incoming waves. They can be outfitted with a variety gun and ammo types. They can also use grenades, smoke bombs and other infanty munitions. ● Engineer – This is the gadget guru of the team. Engineers have lower offensive firepower but make up for it with their ability to setup turrents, open electronic safes, call in air-strikes and lay mines among other talents. ● Medic – With so much damage being dished out on each side your team doesnt have a chance without medics. Under fire medics can offers smaller emergency heals to troops within their range, when not fighting they can give larger heals and prepare your troops for the next battle. They can be offensive but dont expect much damage. ● Ninja – Ninjas are the silent weapons of your crew. They are very valuable during building assaults. Ninjas can be pricey but can eliminate the enemy silently without setting off building alarms and attracting unwanted attention that can jeopardize your mission. They can also sneak past patrol drones without being detected. ● Troop Selection – You can balance your troop team in any fashion you choose. Spend your starting military budget in any way you choose. More Infantry,? More Medics and less Ninjas? Its up to you. ● Chopper Powers – In addition to bullets and missiles your chopper has the ability to use up to 8 ‘powers’. You start with a default of 3 open slots and can expand up to 8 if you wish. The slots are color coded for the type of buff (power enhancement) it provides and to what type of soldier. Red buffs enhance infantry, Green enhances medics, Black is for Ninjas and Yellow = Engineers. ● Also each buff slot and 3 levels of boost intensity. 33%, 66%, and 100% boost. What type of slots you want (color) and which to boost to maximum levels are all up to you. These changes are done during upgrade screens and are very easy to use in-game. Keyboards users simply press a number key to activate (1-8) and controller users use the right/left triggers combined with the gamepad to instantly select and activate slot abilities. Control the Buildings, Control the Game – A large part of the strategy of ChopperSquad X is controlling buildings and rescuing hostages. Buildings contains safes with loot, enemies, hostages and most importantly buff-stations!! Control of buff stations will boost your squads abilities and the enemy will fight you for control of buildings that contain them. Locked buff stations require cash and an operators. In the above graphic the locked buff station will cost $535 and 2 army operators. Also in the visual are 2 active buff stations that are increasing squad accuracy and damage by 5% every tick. Safes contain cash and powerups. Bonuses and powerups are awarded depending on the hostage rescued. Hostage names and a rescue line are displayed with each rescue. This will be one of the next areas we’ll be fully implementing. Everything *inside* the building are ready (hostages, enemies, buffstations and safes with loot and the ability to assign troops to storm the buildings) so the heavy lifting is done. Next stage is getting the troops to move through the buildings following the orders you give them. BlackOpzFX is an indie game studio that loves to make games – It ain’t easy being Cheesy!